Hello everyone! During my visit to Great Adventure last Saturday (4/14/18), I rode the new Battle for Metropolis ride (not horrible, super long queue time) and while back in that section, near the old Old Country area, I took some pictures over the fence of the new Cyborg Cyber-Spin ride area. As of now, about 99% of the remains of Old Country have been lost to time. All that's left is the Showcase Theater and some old small structures, still in the distinctive German half-timbered architecture associated with Old Country. As for Cyber Spin, most of the ride itself has been constructed, all except for the seating area in the center of the ride and everything else regarding the ride's surroundings, scenery, structures (except for the basic structure of a ride operator's station), etc. There didn't seem to be any construction going on that day, probably due to the super high temps that day (it was 95F at 4:00). 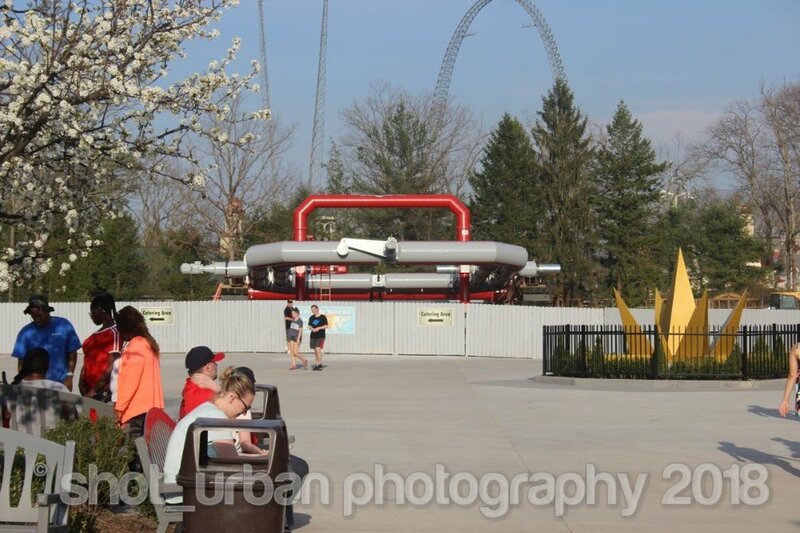 I also noticed something interesting near the entrance to Movietown and the left path that splits off to Nitro. 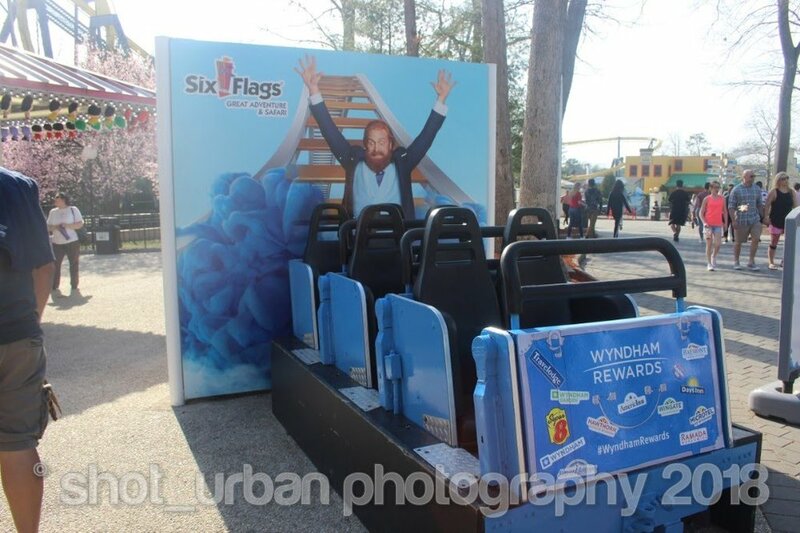 There was an ad for a chain of hotels (Wyndham) which involved a person sitting inside of a roller coaster train and "making your best coaster face", posting it somewhere with a hashtag, and... profit? Anyway, as I passed the ad, I felt as though the train itself felt familiar in some way. Once I snapped some pictures, I was on my way, but I felt compelled to research it... and I had an idea of where it was from. Turns out, after a quick search, the train is from Rolling Thunder. The old lady still finds her way back to us, it turns out. Here, I've provided the photos (watermarked of course). Hope you enjoy! EDIT: Cyborg Cyber-Spin pics will be in reply-form. The attached image is the Wyndham ad with the Rolling Thunder train. Cyborg from behind the fence. Will post more pics later. Still transfering and watermarking. Can we see those queue signs? Cyborg is H O T in those.